According the OECD’s latest Interim Economic Assessment, the world economic recovery may be slowing faster than previously anticipated. Growth in the the seven largest developed countries of France, Germany, Italy, Japan, United Kingdom, United States and Canada is expected to be around 1½ per cent on an annualized basis in the second half of 2010 down from the OECD’s previous estimate of around 1¾ per cent in May. The OECD says that although uncertainty has increased it is unlikely that we are heading into another downturn and the loss of momentum in the recovery is only temporary so they aren’t expecting a double-dip recession. The uncertainty is caused by a combination of both positive and negative factors said OECD Chief Economist Pier Carlo Padoan. The positive factors are strong corporate profits combined with low business investment so capital spending is unlikely to weaken further. And since inventories are now close to desired levels, a renewed depletion of stocks is also unlikely. Conditions in the financial markets have stabilized, and growth remains strong in the major emerging-market economies but consumer spending in developed countries remains weak. Based on the most recent data, the OECD short-term forecasting models show that US GDP is expected to rise by 2.0% in the third quarter but then moderate to 1.2% in the fourth quarter of 2010. In Japan, GDP growth is forecast at 0.7% in the fourth quarter after 0.6% in the third. The combined GDP of the three largest countries in the euro area is projected to grow at 0.4% in the third quarter, rising to 0.6% in the fourth quarter. Second quarter 2010 GDP grew by 1.6% in the US; by 5.1% in the three largest countries of the euro area and by 0.4% in Japan. 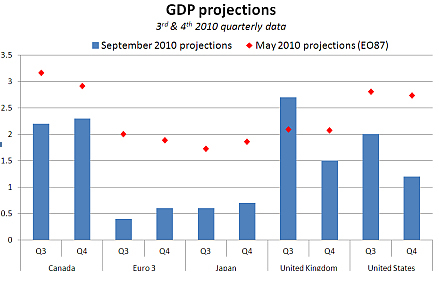 In the following chart we can see that only projections for the 3rd quarter in the UK are above previous projections. Euro zone projections dropped from around 2% to 1/2%, and another drop of that magnitude will place them in the negative growth catagory, Japan is about the same, Canada is about 1% below previous projections and Q4 for the U.S is about half of previous projections. The current stance of both fiscal and monetary policy should remain on course. If the slowdown in the recovery becomes entrenched, and the risk of downturn increases, additional monetary stimulus in the form of quantitative easing and keeping interest rates close to zero for a longer period may be necessary. Countries with more fiscal space could also delay plans for fiscal consolidation. In other words, the effects of the first Trillion Dollar bailout is wearing off, and don’t rule out the government printing more money along with maintaining artificially low interest rates. And those countries that aren’t bankrupt yet might be able to continue their reckless ways for a bit longer in hopes things will get better.